Singapore has come out on top in two separate global fixed broadband speed tests published earlier this week. 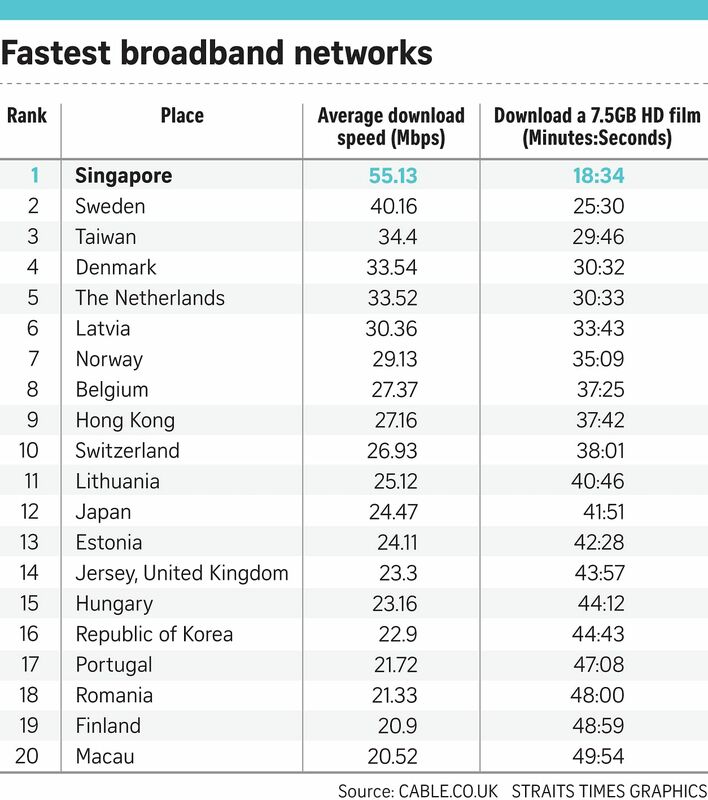 However, one of the tests also shows that Singapore has some catching up to do in mobile broadband speed. According to US-based Ookla's Net Index - watched closely by many authorities and Internet service providers - Singapore aced 132 other countries last month to clock the fastest average broadband surfing speed of 154.38Mbps on computers. It has been maintaining its pole position over the last 12 months, measured and published every month. In a separate report by Britain-based Web consultancy firm Cable.co.uk, Singapore also topped a ranking of 189 countries with its average surfing speed of 55.13Mbps, based on data collected across the 12 months up to May this year. In other words, Internet users in Singapore could download a 7.5GB high-definition movie in less than 19 minutes, said Cable.co.uk. Comparatively, it takes over two days to download the same movie in last-placed Yemen. "Singapore is a city-state covering a very small area compared to many on the list, making it far easier to reach its population with high-speed pure fibre lines. It is also highly tech-dependent," said Mr Dan Howdle, consumer telecoms analyst at Cable.co.uk. Mr Joongshik Wang, consultancy firm Ernst & Young Corporate Finance's partner for transaction advisory services, said Singapore owes the high quality of its networks to competition. "In Singapore, not only do we enjoy fast broadband speed, but there is also enough competition in the market to keep pricing affordable," he said. The Infocomm Media Development Authority (IMDA), the industry regulator and promoter, attributed the intense competition to the rollout of a Singapore government- backed Next Generation Nationwide Broadband Network (NGNBN) islandwide in 2010. The NGNBN allows broadband connectivity to be available at fixed wholesale prices and attracted start-ups like MyRepublic and ViewQwest. Cable.co.uk draws on data collected by research initiativeMeasurement Lab (M-Lab), which is championed by think-tank New America Foundation, Google and Princeton University, among others. Surfing speeds recorded by Ookla are higher than that registered by M-Lab as different Internet protocols were used in the separate tests. Singapore's mobile broadband ranking slipped from No. 1 in August last year to No. 4 in the Ookla Net Index with an average 3G and 4G surfing speed of 45.99Mbps - trailing behind Norway, the Netherlands and Hungary. A StarHub spokesman said: "Singapore's dense (urban) landscape presents unique challenges for telcos. High-rise buildings, for instance, obstruct mobile signals." Even so, StarHub and rivals Singtel and M1 have been upgrading their networks to improve surfing speeds and coverage.